During WWI and during the first months of 1918, the U.S. War Department established and began construction of a Air Service training facility just outside Americus, Georgia. Several months later they assigned "Souther Field" as the name of the camp. Souther Field was again a military air training camp during WWII providing facilities for both U.S. and British cadets. 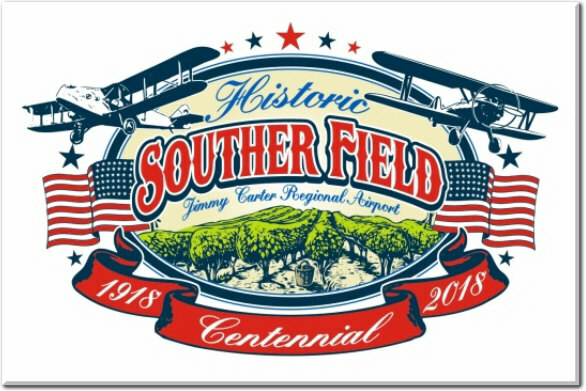 A celebration of the 100 years of Souther Field is currently planned for October 20th & 21st of 2018. Many things have to happen in order for this celebration to be a success. 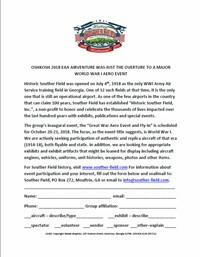 For this event we will celebrate the life of Souther Field with the main emphasis on World War 1. If you have anything from those first years (1918 -1919) that you would like to share, we would love to hear from you as soon as possible. We are sure that many details remain but would welcome your input on any ideas you might have and most of all your ACTIVE participation and here is thanking you in advance. Click on the image below for a printable copy (.pdf) of the information/participant application. Please check this webpage from time to time as we will update as information becomes available.